Baby having trouble sleeping? Here’s the easiest way to help your baby and toddler sleep later. 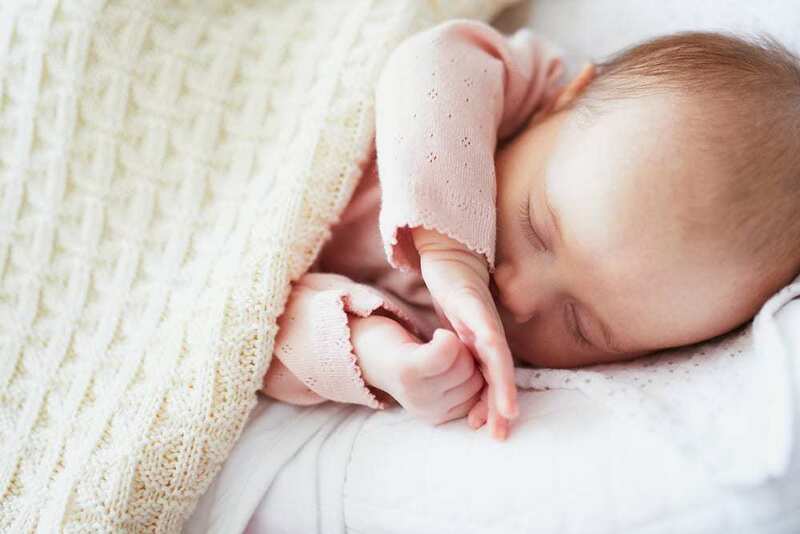 Whatever you do, don’t fall for the baby sleeping myth that backfires every time. A relaxed woman with glossy blow dried hair who slept until 7 or 7:30 each morning to be leisurely woken up by her alarm which snoozed and plays tropical rain forest rain sounds. She opened her eyes and smiled, excited to get dressed up and set off for a day. Already at her best she set off about her beauty routine, ate breakfast and left the house. Fast forward a few years and a child or two or four later. Having been startled to consciousness and long forgotten her beauty routine she stumbles to the kitchen to give her hungry kids some food. I hope that isn’t the case for your sake, but if it is then take heart. If you did sleep training then you will likely have chosen the time your children wake up in the morning. We chose 7:30 a.m. and both of my children (update: now all 5 of them) tend to wake between 7:15 and 7:45 a.m. every day. However, if you didn’t sleep train and are now regretting it, but trying to establish some consistent – and later, for goodness sake LATER – sleep and nap times then try to implement these things. If they are quite a bit older now and set in their ways this may be a difficult process, but there are things you can do. Though you can’t make a horse drink you can lead it to water and make it sit there until it’s good and thirsty! 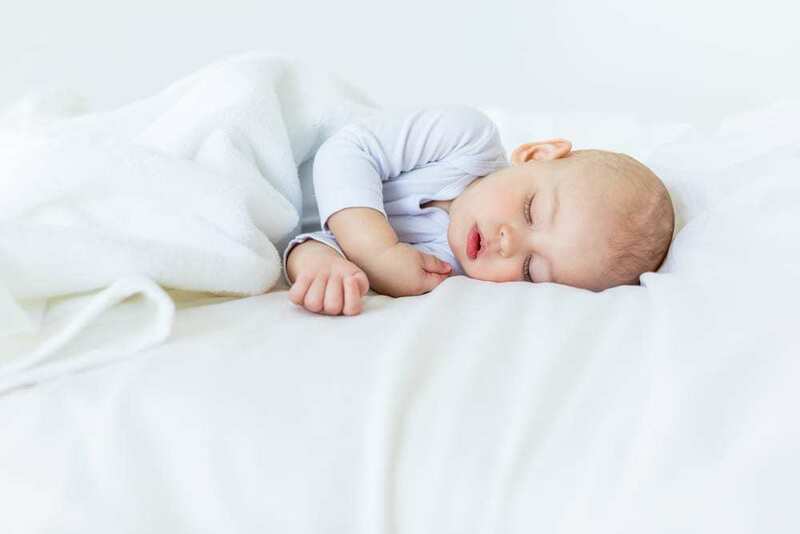 It’s important that your babies and toddlers have positive sleep associations. Whether for nap or bedtime it’s a good idea to have a relaxing and calming routine in place to help prepare your children to sleep. It’s amazing how much easier it is to put kids to bed when they are “in the mood” so to speak. One way of doing this is by reading a few books, diffusing essential oils or applying some oils to the bottoms of their feet (find out about essential oils and kids and babies here), turning down the lights, and singing a song or praying. From birth, the way to establish the time of day you want your baby to wake is by setting their metabolism to eat at a certain time. Think on it, if you get up 5 days a week and eat breakfast at 7am, on the weekends do you find it hard to sleep in? It’s because your body clock is set to wake and eat and you get in a rhythm. So, if they are getting fed at 6am and you want to move it to 7am, then stop feeding them at 6am. Go until 6:15 or 6:20am for a week and then keep moving it back until you hit 7am. In the meantime, see the below tips. This doesn’t mean starve them if it isn’t breakfast time. However, toddlers and preschoolers can wait 30 minutes without needing child services to intervene. 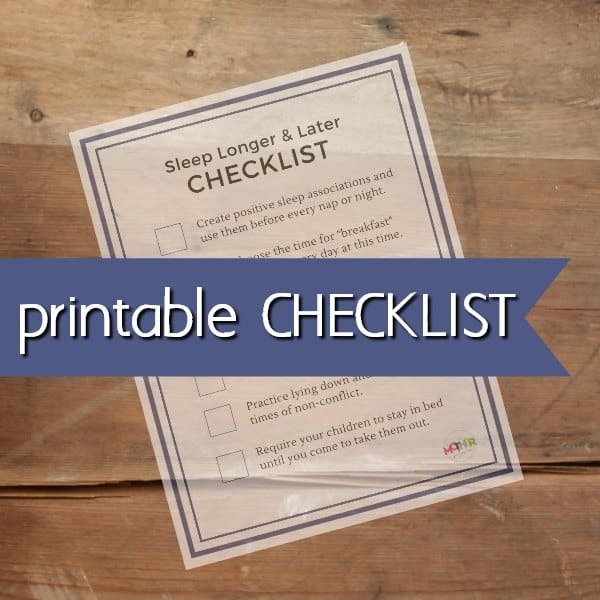 Get my free report chock full of quick and dirty tips to help your baby sleep. Give your name and email and I’ll send it straight to your inbox. Often babies, toddlers and, okay fine, all humans, make noises in their sleep. We go through sleep cycles and babies and younger children do so in 45 minute increments. 45 minutes active sleep, 45 minutes passive sleep. This means if they are trained and used to waking up and being taken out of their crib after only a 45 minute nap then that is what they will get accustomed to. If they wake up, leave them for at least 15 minutes, and if they’re happy, leave them for longer. If they have a bed and try to get out, don’t let them. Tell them they must remain in their bedroom until you give them permission to leave. If they’re older they won’t like this, but we already agreed that children don’t necessarily know what’s best for them, so it’s okay. Once your babies/toddlers realize they can’t just jump up and play because they opened their eyes, the allure of waking up early will start to gradually pass. Parents all around the world think, mistakenly, that getting their children all worked up and super tired before bed will make them sleep like logs. That usually isn’t the case. If their bedtime is 9pm and they wake up at 5am then they are not getting enough sleep. 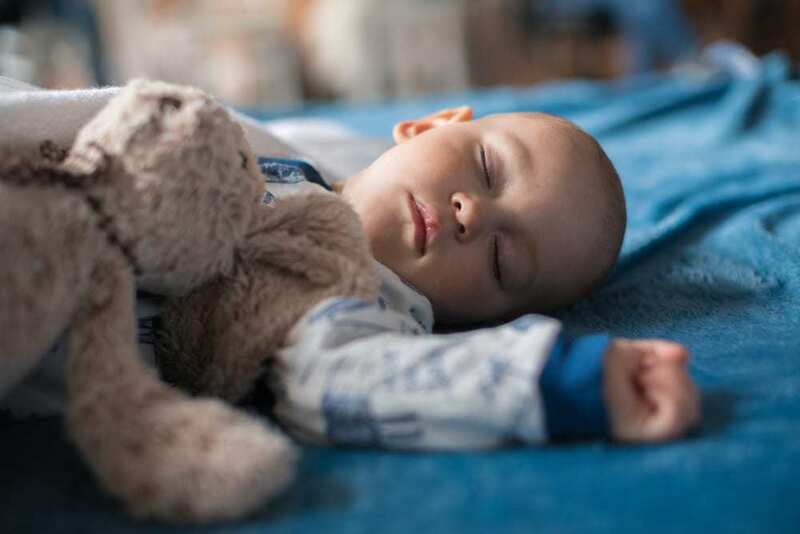 Babies, toddlers, preschoolers and young children need between 10-12 hours of nightly sleep. Less than that, they aren’t sleeping enough. Wait, I’m sure they seem fine. I’m sure they don’t act tired… but look a little closer. Are they disobedient, hyper, hard to settle, hard to focus and wild? Many bad behaviors are tied to insufficient sleep time. Start to move their bedtime up by 15 minute increments. When mine are overtired I will move up their bedtime and 9 times out of 10 they sleep until at least the same time if not later the next morning. And, at the end of the day, if they still wake up at 5am, at least they got more sleep by going to bed earlier. This is a matter of self-control. Self-control is one of the single most important things you can help teach your child because it will benefit them in every area of their lives. The same self-control that helps them sit still and wait for you is the same self-control they’ll use to not walk across the road when you tell them to stop and will help them to not kick their siblings out of frustration. Choose five or ten minutes and get a timer. Tell your child they are going to sit/lay down and rest. Turn off background noise and distraction and have them practice being still. Once they can do 5 minutes, go to 10, 15 and 20. If they can sit still and rest for 20 minutes – at a time of your choosing – this should go a long way in helping to get the horse to drink the water, if you know what I mean. Often, they are so overstimulated they simply can’t calm down when it’s time to sleep. If they boycott sleeping later or napping, avoid letting them get up and wild and free play. Have them sit in their cribs or on their beds with books. If it’s early morning, don’t feed them, but put a toy or two and a book in their crib and, without eye contact and cuddles, walk away. If they begin to understand (and trust me they will) that they can’t just pop out of bed as soon as they want, their own need to sleep and rest will overpower their hope that it’s already time to play and start the day. When they phase into giving up napping, initiate a rest time on their beds where they are not allowed to leave, but are allowed to sit quietly and read. It will be calm and restful and, when they are truly tired, they will sleep. These methods will require a lot of explaining, consistency and follow through. Most children will only do what you say if they know they have to. Unless, of course, they are super compliant firstborns. Set a goal and, little by little, work towards it. It may take a month or two for any change but it will eventually happen. Children are made to follow your lead and sleep is very very important. Fabulous article! I am blessed to have good sleepers, but part of that comes from routines and habits I established at birth (for example, I’m not going to rock/drive/sing/pat my child to sleep because I don’t want them to become reliant on movement or noise or company in order to go back to sleep). These aren’t easy things to do: the impetus is to want to sooth and comfort your child ALL the time – but the rewards are that my children know that they are loved AND they sleep well. I truthfully, and without meaning to impart judgement, really struggle to know what to say to parents who complain that their children get up early and their kid’s lack of sleep, when the parents respond to their children dictating the whole households routine by playing with them, etc. at 5:30 in the morning. Of course kids are going to get up early if they think there is something better to do than sleeping!! Beyond bad habits, not encouraging kids to sleep for longer can also have detrimental health effects- on everyone! Beyond lack of concentration, bad temperament and other behavioural issues in children, lack of sleep also leads to increased risk in cardiovascular disease, diabetes, mental illness, hormonal imbalance and weight problems for all humans and actually impedes development and growth in children! It takes discipline (this doesn’t mean smacking – it means training with the authority you have as their parent who knows best) to get your kids to stay in bed and sleep – but the short term hardships are well worth the long term results, for the holistic health of the individual and the family. I find it hard too and the first question I always want to ask (but feel rude at times) is “what do you do when they wake up at 5:30am?” I don’t want to seem judgmental but just know that good sleepers usually (though granted not always) come from parents who breed good sleepers. I guess that the point is many mothers don’t know how to breed good sleepers so I’m blessed (and you are too) that we read up enough and learned from others so that we could avoid that problem from the get go. Now, when any of my friends are pregnant for the first time I am like “SLEEP TRAIN SLEEP TRAIN FOR THE LOVE OF GOD SLEEP TRAIN”!!!! You both try to write as if you don’t judge but it is exactly what you are doing. Granted you put a little comment of (though granted not always) in there but all I can do is tell you and all others to be greatful you have a good sleeper in personality and genes, as well as if you believe your parenting helped encourage that. I can tell you from my experience that no amount of reading, preparing, trial and error and firm dedication can mend some issues, sleep training can be horribly wrong suited to some. From hard health issues to even just mild health issues like troublesome reflux teed with a personality of a child who isn’t good with handling pain or has sensitivities in other ways. Adults have traits that are just who they are, I get headaches more than others and I wasn’t trained to get them through bad parenting on my mums behalf. “I don’t want to seem judgemental BUT….”, as you say Rachel is being exactly that. I would give anything to have been able to have a better time with sleep, in the end it is nothing to do with training, some kids don’t dictate the household rules, nor do they get what they want by forcing it and still have troubles with sleep…… if forcing training works for some and that is the parenting choice that worked then be greatful, if you are happy with the outcome and relationship – don’t walk around wasting your energy thinking that those that don’t have the success didn’t try hard enough from birth or discipline hard enough as “K” mentions! I am a fantastic mum as are both of you. I want to raise a well rounded healthy child who’ll be a strong caring man. My son is independent but knows we have rules and we stick to them, he will have manners and we will talk things through, I will in turn respect him as a human being, not my possession or convenient, we do what we can to have the best household. I feed him properly, no sleep deprivation or issues make him unhealthy, and he dosn’t rule our house, nor are we weak parents. He may be 2.5 and still not slept through the night but his reflux healed and he now lays flat which he couldn’t do before, and he may need us to get to sleep but he didn’t win and ruin our lives. He was born to the right parents to help him. Your kids obviously were born to the right parents who would help with good sleepers to suit your lives. I’m glad my son was born to me. L, thank you for writing and sharing your experience and feelings and I’ll admit you are right: a lot of it comes down to child and personality. I certainly never want another mother to feel judged or less than because her kid doesn’t sleep through the night. ESPECIALLY if they don’t even think it’s a problem!!!!!!! I only want to help those who do want their kids to do so. And you are too right that medical and certain health or diet issues will MOST CERTAINLY affect sleep and if I don’t point that out I’m remiss. Again, thanks for sharing your feelings because I do want to have a teachable heart that knows it’s not always right! Thanks for the reply Rachel. It is hard not having a good sleeper and it would be lovely to be different, wouldn’t say I would choose it and be ok with it, but I wouldn’t change having my son and that counts more to me as does nurturing him differently to training. It can’t always be black and white for everyone unfortunately. 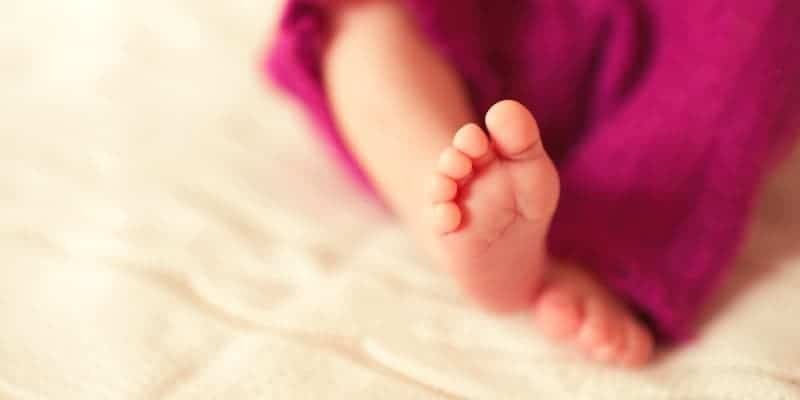 I would normally not read anything about sleep training and I probably shouldn’t have even replied as normally I wouldn’t when my opinion is just different to someone else for a vast array of reasons( some pre a child and some learnt from having him along with all my research post and pre too lol). I definantly learnt not to judge others and this topic usually gets people on opposite sides of the fence it is sometimes a hairy one, for me I decided to just know that all mums love their children and that’s it in a nut shell the rest is none of my business, that keeps me from being rude so I know I was a bit pointed in my post than I normally would. I stopped reading that topic many many months ago now, it is not for me even if I had a good sleeper, where I read the link from and how I read the title it was not what I expected and was surprised I ended here. Good luck though with everything and I appreciate the kind reply. I know it’s a hard road to have a dear child who doesn’t sleep well, but I want to say to you (and anyone else reading) there are often very real reasons they aren’t “good sleepers” and that is in no way a reflection of anything except that: they have barriers to sleep. But great news that he’s able to lie flat now, I feel for your sweet child. My babies had trouble with that early on and it tugs at a mama’s heart to feel they are in pain and I completely understand any choice made to alleviate their pain. Wow – just discovered your blog recently. You are such a wise & talented writer! Love it. I love the whole idea of Babywise & my kids sleeping more! I read the book when I had my first child and I did take on some tips and not others. The main thing I didn’t like about Babywise was the tight structuring of such a young baby’s sleep and feeding. 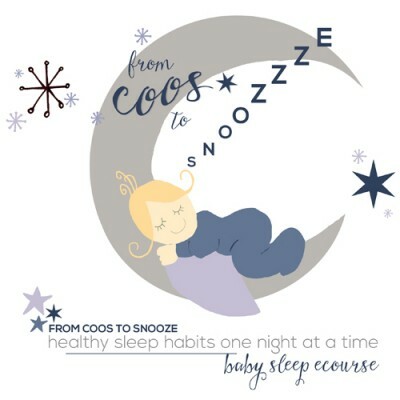 I did use some sleep training methods when my first child was 6 months (once i knew she was being fed enough in the day) and then later again at 10 months after the whole teething problems were over & she had three meals a day. It worked a treat & she started sleeping though. I think trying to structure a newborn’s feeding and sleeping schedule is definitely great for parents but I wonder how good it is for the baby? A baby needs their needs met, that’s how they develop trust. I think this definitely can be done through a structured routine but not always…it really depends on the baby. I’ve found it helpful to use the three hourly feed as a guide when they are young but to be flexible in changing it if they are sick/won’t settle or seem genuinely hungry. On the other hand, I agree with the whole early waking thing in terms of putting your child back to sleep and not playing with them. In our household my husband wakes at 6am for work so he happily gets up to my early riser daughter but before then & it’s straight back to bed for her. I do think there are some kids though that just like waking up early. My sister in law went by Babywise & her son was a fantastic sleeper but has woken at 5/5.30am every day since he was young. She always sent him back to bed but he never went back to sleep. At least now he is older he can entertain himself. Thanks for writing such an interesting peice. Hi Mel! You are right that with any book we should do just do what we agree with and not what we don’t. I think Babywise helped me because I knew I wouldn’t know what my baby needed just because it cried, you know? Crying can be for so many reasons I was insecure. I often fed before the 3 hour mark, not a hyper scheduler by any means, but it helped me to determine that many times I knew they weren’t hungry, they were tired, etc. I think there are probably many many sleep train methods that work, though! Oh yes, some will rise early. You can’t make a horse drink but you can make it thirsty. Ha! Rachel is extremely knowledgeable but also super down to earth. She has a heart for moms and, since some of us don’t have mom’s we can look to for great advice, I thank the Good Lord every time I come here to visit. Nothing she advises is horrible(like the cry it out method). She stresses having a good routine that fits YOUR family. I love all the advice I get here and have a notebook for taking notes! It is a huge relief to know if I’m stuck with a problem, I just need to go to A Mother Far From Home. We have done babywise since birth, my son no matter what always wakes around the 6-6:30 we have just started lambing ( we live on a big sheep farm in New Zealand ) i will be up feeding lambs every 3 hours and I desperately want my son to learn to sleep until 7:30. He goes to bed at 7:00-7:30 each night ( easily ) takes a 2-3 ( sometimes four) hour nap in the day. Hi Genevievr! (beautiful name, by the way). I think if it were me then I would try one thing at a time for a week or so to see what would work. My son is 16 months and has started waking up about half an hour earlier every morning and he does this screamy whiney cry thing and I normally just let him amuse himself until 7:30. If I go in, like you said, it makes it much worse. They do go through phases like this, but if your son has always woken up at this time perhaps he needs the 10 hours at night instead of the 12, as Babywise says some babies do. I’d try these things in this order! 1) move bedtime back until around 8pm and then if that didn’t solve it I’d shorten his nap by half an hour and see if that helps. I’d also give him a big snack before bedtime to be sure it isn’t hunger that’s waking him and then I’d probably let him stay in the crib until my desired time to get him up! If he realizes that he can’t get out of the bed until 7:30 then he is likely to sleep longer or at least play contentedly in his crib with his toys until such a time! Good luck! I am really struggling with this right now. I read through the Babywise book when my baby was a newborn and adopted those tenets that I felt would work for her. She was an AMAZING sleeper for a long long time. She’d go right to sleep for nighttime and naps and she slept a good long time. We never had to rock her or anything and she didn’t even want us to. For the past few months, however, her sleep has just gotten worse and worse. And it seems that everything I’ve tried has backfired. I tried changing her bedtime. That worked for a little while, but she went back to waking up early after a while. I tried giving her more naps and less naps. I’ve tried crying it out – can eventually get her to fall asleep after MUCH screaming, but then she’ll wake up 15 minutes later anyway! As soon as I think something is working it either stops working or something else goes awry. At this point, she’s 17 months and we put her to bed around 8. Last night she woke up at 10:45. Cried it out with her and eventually got her to sleep until 5:30. Then cried it out again. She fell asleep at 6 and woke up at 7. We got up for the day. She used to sleep until 8 or 8:30. She was exhausted by 9am, but we had church from 9-12. By the time we got her home she was literally falling asleep standing up, but only slept from 12:15-1. It’s like this EVERY day. She used to get about 15 hours of sleep each day. Now it’s more like 9. And it just keeps getting worse! What in the world can we possibly do that we aren’t doing? Please help. Thanks. Oh Sheri your poor girl! I will say my 18 month old went through a similar period at 15-16 months. Wouldn’t nap without screaming the house down, fought bedtime and woke super early. In his case he was teething!!! It got better for him only with pain treatment and teeth coming through. I’d suggest medicine, essential oils, something to chew on and prayer for perseverance if that’s the case. OTherwise, I’d say it isn’t behavioral because you know she’s tired and not enjoying it. Also, it’s clear she still needs a nap since she’s wiped. Another thing I’ve done is to throw out the routine for a day or two and just let them reset when they can. If she usually naps at 1 but is falling asleep at 10, let her sleep and don’t wake her. Help her to try and be as rested as she can while this is happening. Could it be teeth? Thanks for your response. I don’t think it’s teeth because it’s been going on non-stop and only getting worse for such a long time! It started way back in November! I’m still planning to try a couple essential oils to try to help her relax (waiting for them to get here). I’ve tried both throwing out the routine and trying to stick to various ones for a week at a time, but I’ll try it again. It’s all so confusing! Right now there is no “usual” naptime because it’s been going on so long and I’ve tried so many different things. Right now I’ve been doing 5 hours after she wakes up for about a week. Anyway, I’ll let you know if something works! How old is she again? If she’s less tan 18 months try 3 or 4 hours instead of 5. Yes, essential oils will most definitely help. Which ones did you order? I currently have four boys, the oldest 5 yrs and the youngest 7 weeks. This is a great article, I’m glad to have found your site! It’s always good to have a refresher on sleep structuring. I do somewhat agree with L., though, in that personality and sleeping arrangements play a great deal into developing healthy sleep training. I understand that lots of people don’t like that term, as it pertains to kids! I try to encourage newer moms in what I have found and that is: personality/tendencies might change what you need to DO in order to get your kids the rest they need, so don’t decide that since you followed someone else’s plan and it didn’t work, your children dot have those sleep needs! It’s important not to overlook physical activity and dad’s schedule as well. For instance, for the first three years of our parenting journey, we lived in Tokyo: the sun came up before 5am most of the summer and the artificial light meant night didn’t start too early either! So I might have been one of those moms who had kids getting up at 5:30 or earlier, and it was not a disobedience issue. We solved the problem by maintaining a 2-3hour afternoon nap, which my oldest still sometimes takes at his own behest now that he’s in “rest and quiet time” phase. It allowed us to get breakfast with my husband (an early riser, military man!) and have several hours of outdoor play before coming in during the hottest part of the day, having a cool lunch and rest time, and then be fresh for later afternoon and able to enjoy daddy from when he got home around 5:30 until bedtime at 8:30. We could have fought for a 7-7night time, and they wouldn’t have seen their dad. AND their constantly-pregnant mother would have still felt frazzled. The key has been making sure nap is non-negotiable, and it isn’t. Enough actual physical activity and no tv/scree time has made that a reality for us. Amanda, love your comments and thoughts! You are right that the family situation and child’s needs and temperaments will play a part. Some people keep their kids up later so they can see their hubby and, likewise, some moms that are early risers (or who have kids that are) don’t mind starting the day at 5:30. And a good nap will totally offset many sleep issues so I’m glad you added your wisdom. Also, I’ll note again for others reading, if your child doesn’t nap well or “sleep well” etc. that isn’t some reflection of your value as a mother!!!!! I always write for moms who are looking for some solutions to try out, not to pressure anyone to do something they don’t care to do! Some good suggestions, thanks! I’m hoping for some advice – we did sleep train my oldest kid, he’s 3 now, and he did great for the longest time – then one night about a year ago, I put him to bed, and instead of going right to sleep, he laid there awake for more than 2 hours before finally drifting off – and woke up an hour earlier than normal the next morning. And he’s done that every single night since then. I know he’s not getting enough sleep, but no matter what I do, he can’t settle down at night. For mornings we bought a toddler clock and taught him he couldn’t come out until the clock lit up – he loved it for a few months and now ignores it completely. Trying to put him back to bed basically involves him screaming, waking up the baby, and then running back out of his room 2 seconds later. If I put a baby gate over his door, he’ll just stand in the doorway and yell for me, waking everyone in the house up. Molly, how very odd. Do you think it’s nightmare related? My first thought is to start putting him to bed significantly early so that even if he takes an hour to go to sleep he goes to sleep early. Then… I’d start some soothing things. I would suggest essential oils and actually had a reader write something similar (on this post or another? I’ll have to look) that the peace and calming did wonders. If you are interested in essential oils (or have some arleady) let me know and we can get you started with that. Aside from that… is it an emotional issue do you think? If it’s emotional I think maybe something to calm him or alleviate his anxiety? Does sitting in the room or laying with him for a few minutes (maybe not until he’s asleep) seem to help? I don’t think it’s nightmare related, he doesn’t ever seem to have nightmares. My best guess is that he doesn’t get enough activity during the day, I work full time from home so I’m basically tethered to the computer all day. He already goes to bed pretty early, around 7, so he just lays there until 9 or 9:30 before falling asleep. I thought maybe it was because he was outgrowing needing a nap, but if he doesn’t take a nap, he’ll pass out at like 5:30. Or if I give him a tiny amount of melatonin, he’ll fall asleep right away at bedtime, but I hate to do that very often since it seems like nobody knows the long term effects of giving it to toddlers. I’m torn about essential oils. I know some people swear by them, but I have too many doubts to pay so much money for them! We do tuck him in every night, lay with him to read a story and sing a song, but my husband seems to think that makes it worse and just gets him wound up. Would you suggest even trying a bedtime earlier than 7? I tried for a few days but felt kind of mean for putting him to bed that early. Thank you! I appreciate your willingness to give me some input :) Maybe I will try and earlier bedtime for a few days, he was up at 4am this morning and wouldn’t go back to sleep, so right now I’m thinking the worst that can happen is that he keeps doing that haha. I work with special needs kids doing ABA therapy, and a thousand YESes to this article. Consistency and gradual changes in demands placed can teach ANYTHING! Keep spreading the word. I always feel it is important to respond to your children’s needs in the way you feel most comfortable. I have always co-slept and breastfed on demand and guess what…my children are great sleepers. I have never been held back by having to be home at a certain time or watching the clock for feedings. I am so glad that scheduling works for you but I am very happy being able to cuddle my babies to sleep knowing that my preschoolers will fall asleep just fine without me. Another benefit is because our family is very involved in church activities our children can be flexible and go to bed as soon as we get home and sleep until their body is rested. I can’t say it’s 100% perfect but that is just not our life and I doubt it is anyone’s. Again I am so happy for that you found something that works for you but I’m also tired of anyone thinking they have all the solutions to child rearing. You are not alone. My 19 month old is a great sleeper but has recently started getting up super early too! I’m thinking teeth. I’ll first ask, is your 23 month old teething, have an ear infection, sick, not eating enough? These will cause him to wake early. Also, if they don’t nap well, what time do you put them to bed? My son is 9 mos old and currently our desired wake up time is 7am but he rarely sleeps until then. He just started sleeping through the night, but we had to drop his night feed to do so. He has early wakings of 5:30am some times and will just lay there happily, sometimes trying to go back to sleep. I never get him until 6:45 and don’t feed until 7. So I don’t think he’s hungry….but may be just enough to not be able to get back to sleep? Anyways, my main question is this. I use wake times for nap and bedtime and I’m tired of it! I want to go “by the clock” and have a schedule. Because of going by wake times (that were suggested elsewhere) his first nap is 9:45 and next nap is usually 2:30. I would much rather have 9/9:30 and 1:30 naps like you suggest…so that when we have other children they are all napping at the same time. But, that would mean less time between his naps, I’m afraid he won’t nap long because he’s use to (or even needs?) longer time in between his naps. Do you have any insight on this? I”m also limiting both naps to 1hr15 each. It sounds like your kids slept 12 hours AND then 3+during the day…I’m worried he may not need that much sleep (ie won’t sleep that much) but I don’t know for sure since he just started sleeping through. Any tips for me to try a by the clock schedule? (now we are doing awake times of 3-3.5-3.5) thank you!! I would try doing exactly what you want to do first. Sometimes I needed to have a shorter nap between my kids’ naps because of timing wise and they still seemd to nap. 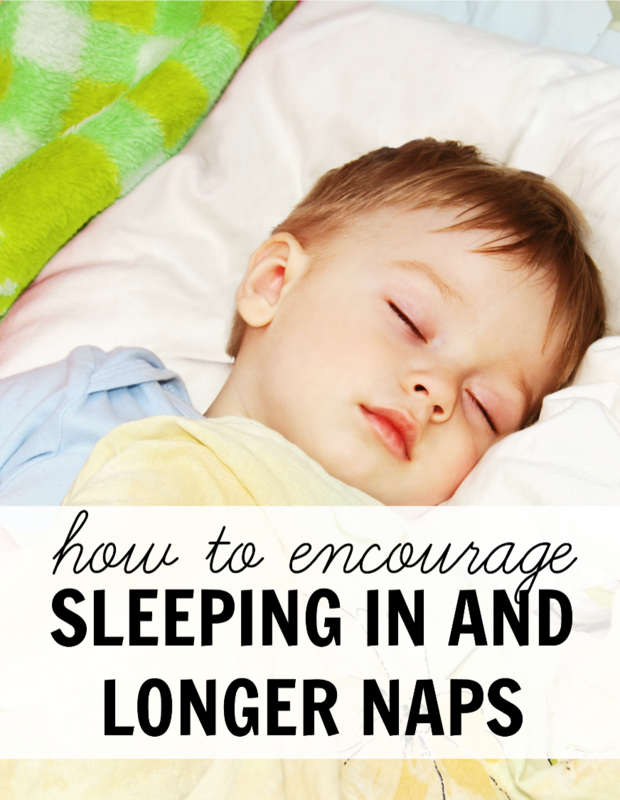 Perhaps a bit shorter, but if your son has less sleep needs that should be okay! It has a lot to do with personality. When i was pregnant i read all those theories about sleeping babies and how to train them etc. But my boy doesnt sleep, whatever i have tried. My friends first child had sleeping “problems” too, with her second child she did exactly the same things, nothing was different, but she was a “sleeper” from the beginning. It has a lot to do with personality, much more than people think. I accidentally posted my question under a different section, maybe you saw it and could delete it? But my question is on how to discipline and when with a toddler who wakes and leaves her bed before I come to get her at 7am. I love your advice about teaching kids to stay in their bed/room until you get them each morning. I have also read this advice in other places, I’d like to do it. But how do you enforce this during the teaching? I have only one daughter right now and she is 2. We took her out of her crib into a toddler bed and after 6 months have gone back to a crib last night because she keeps getting out of bed during the night and early in the morning even if her door is closed-(she can not open it yet). I could desperately use advice on enforcement/discipline ideas for this scenario. Should I be disciplining during the night, should I discipline her when she gets out of bed between 5-6am? I’ve tried talking to her and telling her what I want and expect the night before and in the morning but that is not getting the point across. What would you try?! Thanks! Any other Mamas have ideas, I’m all ears! Melissa, what we’ve done is to put the toddler back into the crib and explain they can’t use the big boy bed until they’ve learned to stay in the bed. I think nowadays we feel pressure to get them in “big kid beds” but actually they’re fine in the crib, right? I’d just leave her in the crib until you think she’ll stay. THat will also communicate what exactly you want her to do! I’ve read the guide (in an hour or so because it’s short) and I knew exactly what to do and how to do it but I didn’t really believe it can be that easy. 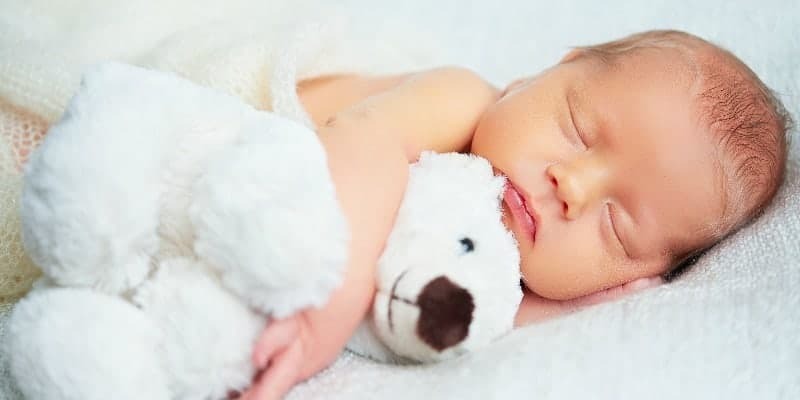 I started to read about this method and people were saying that they sleep train their babies for a few days sometimes even 3 days and that was it, their babies were able to fall asleep on their own, they nap longer and stopped eating at night. So I gave it a try and SHOCKER! Took us 4 days with my boy and 4 days with my girl! Sarah, YOU ARE SO RIGHT. It is a very quick thing with results that last on and on. Yes Sarah you were right! I thought it’s a long process as well but I was wrong. I wanted to thank you for your post. It inspired me to use the same guide for my baby after several months of sleepless nights and I’m happy to report it has worked for us. Thank you so much for sharing your experience. I Loved all your articles and definitely plan on incorporating these tips with my new baby. :) I have a few questions if you don’t mind, and I apologize if these have been answered already somewhere else that I didn’t see. First , you mentioned in one article that the baby needs to learn to distinguish day from night and how to teach that …..but then in a separate article said for naps during the day turn down the lights as well? Will that be confusing to the baby? Also, you did mention putting the baby in the crib for naps. I wanted your opinion on having the baby nap in other places such as a baby swing or rocker? And then last question I promise….. When did you start having your babies sleep in their own crib at night? I have a pack n play with the newborn napper for the first month or so but would love to know your opinion. Thank you so much! Amanda, when not napping during the day we turn on lights, open curtains, etc. so that feeding is bright and well lit. Then when it’s nap time we’ll have a darker setting. At night I don’t turn on lights AT ALL for anything. I’ll use flashlight app on phone to help change diaper. I think sleep baby wherever you want, girl, but be aware that things that rock or swing can be addicting.